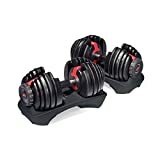 Whether it be exercises for legs, back, chest, abdominal, arms or shoulders, Bowflex adjustable dumbbells are a good choice for those interested in total body workouts. 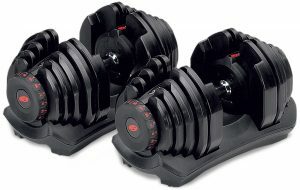 The adjustable dumbbell craze was propelled by the 552 with its the innovative, space-aged design. 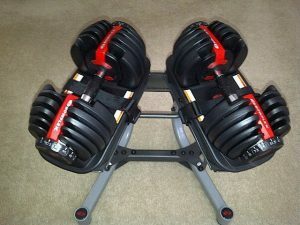 In late 2011 Bowflex added a new model based on its wildly successful cousin but with notable changes and improvements. 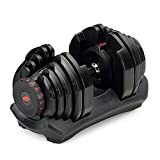 For the most part the Bowflex 552 and 1090 aren’t meant to directly compete against each other as these two models serve different needs. Most notably the 1090 can be adjusted up to 90 lbs., while the 552 maxes out at 52.5 lbs. but allows for more exacting weight adjustments. That said, engineering improvements were made to the 1090 that in some aspects put it in a different league in terms of quality. The base is lighter, handles have been upgraded, etc. The 1090s have a plastic base which may seem like a disadvantage, however in this case it isn’t because it’s rigid, strong and much lighter than the base on the 552s. If you don’t mind the weight the metal base on the 552 is good too, but to most this will be viewed as an improvement. The 552s use a dial system that moves in increments of 5 lbs., or sometimes 2.5 lbs. strategically placed on the dial where finer adjustments are most advantageous. The starting weight on the 1090 is 10 lbs. and it can go up to 90 lbs. It’s adjusted in increments of 5 lbs. 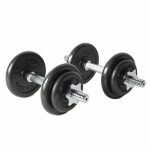 Due to these differences in capability the 1090 is better suited to bodybuilders and heavy lifters. The 552 is no slouch for building strength and there is indeed some overlap, but this model is best for people that tend to use the lower settings more often as more flexibility is provided for those who do. The rubber elements added to the handles on the Bowflex 552 do provide nice grip. However, the price for this product design decision is the rubber may get worn down or even split with heavy use. In contrast Bowflex switched to all-metal handles for the 1090. Most won’t miss the rubber as the pattern for grip on the metal handles works well too. Size may matter but in this case the difference isn’t huge. 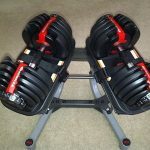 With the 552 each dumbbell is 15.75” long x 8” wide x 9” tall. 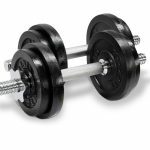 The 1090 dumbbells measure 17.5” long x 10” wide x 10” in height. 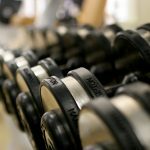 The 1090 may currently be the latest and greatest design offered by Bowflex, but if you’re buying now its best to focus on how much weight you plan on lifting. If that figure is more than 52 lbs. per arm the choice is simple: go with the 1090. If not, the 552 despite lacking the noted improvements is still the best choice. 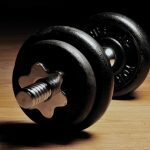 Next Next post: Are Fixed Dumbbells Better than Adjustable Dumbbells?